I don't now how they got such a high rating from Good Sam. This place is poorly maintained, swimming pool dirty, the only paved road is the entrance, everything else is poorly maintained gravel. Sites are narrow and barely long enough for our 38ft Class A. Our site had a brick edge with a drop off, when we opened the door we had to avoid the drop off. Internal roads are narrow. Staff are rude, since we didn't mention we were good sam members when we called that afternoon to make a reservation they wouldn't honor the discount. Office and store were never open from 4:30 in the afternoon until we left at about 10:00 am the next day. After numerous attempts to get a receipt for our credit card payment they finally sent it by e-mail. I would never recommend this place unless it is the last resort. Only good thing was the restaurant in Orland . Excellent campground and facilities. Would highly recommend to everybody!!! 1/5 mile off freeway I-5. Very quiet. Staff extremely polite. Flat and easy hook-up. They have Wi-fi, good T-Mobile Cell service for hotspot internet. No cable but good Reception from local stations. Close to shopping, and gas. Good place to stock-up. Pool, and wine tasting room. Grounds are very well maintained. We stayed here on a trip to Chico. The park is great, just far enough away from the freeway, but close to Great Food as recommended by the park owners. We will stay here again just because we can. Nice shady spots, with lots of trees throughout the park.. Owners are the best & for you wine drinkers they have a cozy wine tasting bar in the main office building. The whole park is so well maintained, just a terrific place to get a great nights rest or to spend a week checking out the area. We were only here for one night, but really glad we found it. It's just the right distance from the highway so noise is not a problem, but access in and out is easy. We were in a very spacious pull through with level gravel drive and a nice grass lawn with table. The cobblestone paver border along the grass area is a nice touch. We didn't feel up to a dip in the pool, but it looked clean and inviting. The wifi was one of the best we have had in any campground. Owners were personable & friendly at check-in. The park is beautiful. A good place to have a group event. A really nice little park. Very friendly front desk, easy in and out, nice wide spaces and good WiFi. Just the right distance from the Freeway. Quiet. We only stayed one night but would have been comfortable for a week or longer. We'll definitely be back. The Parkway for Sacramento Valley Speedway accommodations. 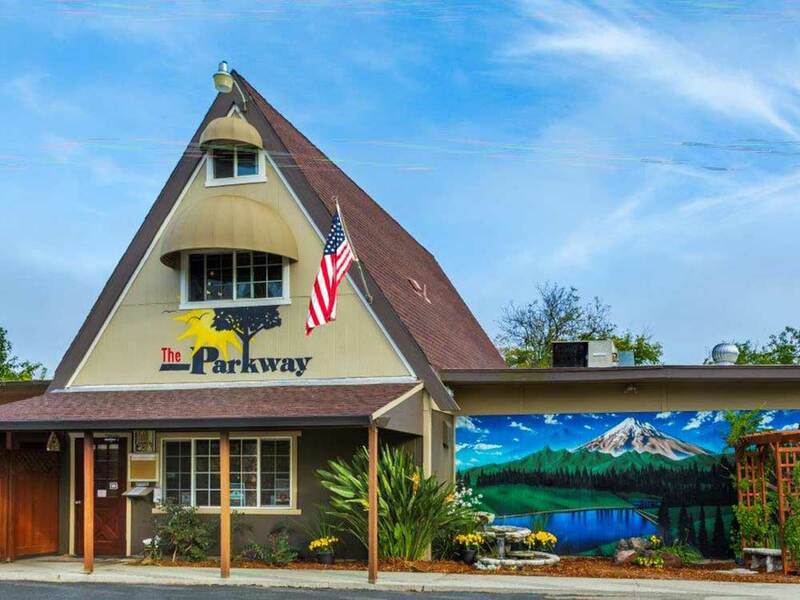 We always stay at The Parkway RV Resort & Campground during our Mini Stock, Mini Truck, Mini Mods, Hobby Stock, Wingless Sprints, Demo Derby, and Street Stock fall racing excursion to Sacramento Valley Speedway, over there in Orland, California. So peaceful and quiet at The Parkway Campground, after a long day at our SVS races. Always friendly and pleasant folks there too. Be sure to relax at their nice swimming pool, and around The Parkway Fire Pit at night. Have a cold one with the boys! Well off the highway this shaded park is quiet and comfortable. We stayed here on our way through but would be quite comfortable staying days on end if we had a reason to. Friendly and helpful staff, clean and roomy restrooms and showers, lots of trees and shade with almost perfectly level sites. What more can a person ask of an RV park. Kudos to management and staff - great job!